In case you are puzzled, Bagehot’s words do not refer to the United States Constitution, but to the English Constitution (Bagehot’s 1867 book is entitled The English Constitution). You might recognize this speech if you, like me, have fallen under the spell of the Netflix series The Crown. The Crown is a splendidly produced and acted period drama recounting the early reign of Elizabeth II. Those of us suffering from mild withdrawal since the end of Downton Abbey now at last have a way to soothe our need for consummate acting, lavish costumes and sets, and witty dialogue spoken with a posh English accent. So far, with one season down in The Crown, we have witnessed the transition from George VI, who died in 1952, to a young Queen (portrayed by Claire Foy) still in her twenties, struggling to live into the authority and purpose of her office. In an early scene in episode 7, titled “Scientia Potentia Est,” we flash back to a young Elizabeth Windsor and her constitutional tutor, the Vice Provost of Eton. He explains to the princess that those two elements of British government, the efficient and the dignified, “only work when they support each other, when they trust one another.” As we shift back to the narrative’s present (1953), that question of trust settles at the heart of the episode’s conflict. Britain faces a foreign policy crisis: Russia has been testing a hydrogen bomb, a situation requiring the delicate intervention of Prime Minister Winston Churchill (rivetingly portrayed by John Lithgow) and Foreign Secretary Anthony Eden. However, both are incapacitated by illness—and they collude to keep this fact from the queen. Of course, she eventually finds out. Before all that drama ensues, though, we American viewers get to marvel for a moment over the neat separations of the British system. A prime minister keeps the government operating, and a monarch provides all the grandeur and symbolism the public desires in a leader. How wise! That way, you can assign some gruff, deeply well-read, militarily experienced statesman like Winston Churchill to fuss with the day-to-day tangles of governing a nation. And meanwhile, you can foist all the ceremonial duties and photo-ops onto an entirely different figure, someone who has been raised precisely for this purpose—to symbolize the dignity of a nation and its history. I had to consider for a moment why the scene of young Elizabeth with her tutor hit me so hard. And then I realized—it’s because the person the U.S. has elected to be the next president promises neither the efficient nor the dignified functions. We might argue about the wisdom of particular policy intentions the president-elect has signaled, but here is a person—as so many have pointed out—who has no experience whatsoever in elected office, nor with foreign policy, nor with military service, or even (that which was so mocked for President Obama) with community organizing. He is entirely unqualified to run a government, as his cabinet appointments thus far manifestly demonstrate with their blow-the-place-up cynicism. And then there’s the lack of dignity. For those who couldn’t understand why so many people seemed emotionally devastated by the election results, I would suggest that we look to the symbolic function, the “dignified” function, the need for our president to lend “significance and legitimacy” to the mundane operations of government. I do not need to rehearse how the president-elect fails to embody the best of American ideals. Even people who voted for him admit that much. We ask a lot of an American president, expecting that person to serve both the efficient and dignified functions at once. We pretend, sometimes, that the efficient is the only part that matters, because after all this is America and we don’t have a monarchy—we rejected all that silliness and excess and incipient tyranny in the eighteenth century. But the symbolic function is unavoidable nonetheless; it’s human nature to expect it, even to long for it. In the latest Atlantic, Ta-Nehisi Coates laments the end of President Obama’s second term specifically because of his symbolic power. Though Coates has sometimes criticized Obama for being too much of a peace-maker, Coates recognizes with gratitude what it has meant to have this man in the White House—mixed-race, identifying as Black, a constitutional scholar, a family man with integrity and gravitas, at ease with hiphop culture and skilled with a basketball, calm and rational. Dignity embodied. You may have complaints from the right or left about President Obama’s efficient functions. But he has admirably fulfilled that symbolic function. 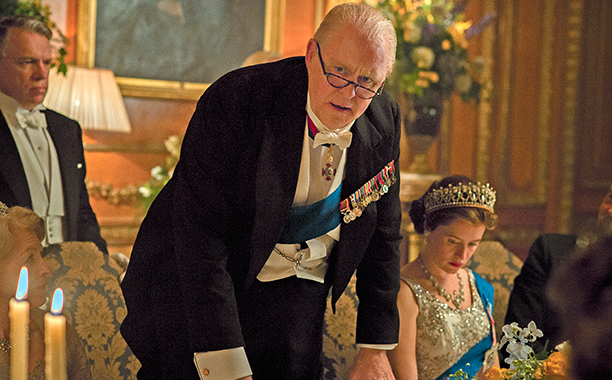 One of the things I appreciate about The Crown is the way it balances respect for the British monarchy with a subtle acknowledgement of its shortcomings and excesses. In “Scientia Potentia Est,” Elizabeth suddenly recognizes how woefully uneducated she is. She knows the constitution and has mastered palace manners but, the episode reveals, has studied little else. And yet she is charged—called by God no less—to ensure that her nation is properly governed as the nuclear age dawns. She needs to know about more than dogs and horses to sit next to statesmen and dignitaries, to tussle with the wily Churchill, and to negotiate with a family and a palace staff who insist that you may be the queen, my dear, but this is how we do things. Poor girl can’t even choose her own private secretary, try as she might. Elizabeth gained the strength to scold her elder ministers from a previous conversation with the rumpled, tweedy professor she had hired to help her “fill in the gaps” in her education—a hopelessly overwhelming task. The professor assures her, however, that in this particular case, she has everything she needs. She is in the right, they are in the wrong. She only needs to stand for integrity and principle, and she has those qualities in abundance. Thus she decisively rebukes both her errant officers-of-the-efficient in terms of duty—hers and theirs.